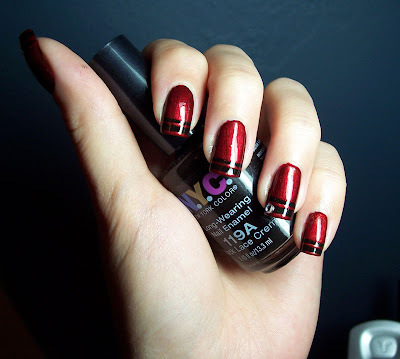 I used painters tape again, black base and put two strips then painted red over it. The red bubbled like crazy! That is great and I love the little jewel, nice touch. What red is that? It's a pretty shade, even if it did bubble! That's too bad the red bubbled, I hate it when that happens .. Thanks Mary, the red is Maybelline Express Imperial Red. It looks very good over black! 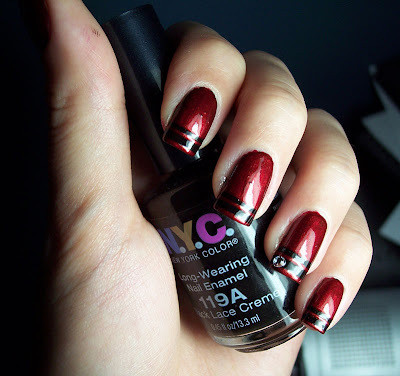 Love this manicure. I love this shade of red. Thank you Lucy, it is on my favorites too!